One of the longest serving journalists on not just the north-west coast but the entire state, Terry Morris has had a remarkable 40+ year career observing and writing for the game of football in northern Tasmania. Raised in Spreyton before moving to Devonport in his later youth, Morris was a promising junior sportsman before a badly broken leg suffered on his paper route ended his sporting ambitions. Morris subsequently discovered his lifelong passion for journalism while working on the Devonport High School magazine, and upon graduation he entered into a cadetship at The Examiner in Launceston, in part thanks to a reference from north-west sporting identity and Tasmanian Football Hall of Fame Icon, Geoffrey ‘Paddy’ Martin. The two would share a close friendship for the remainder of Morris’ life. 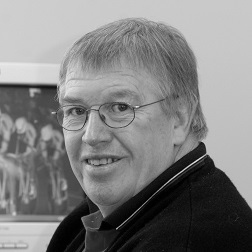 After a series of small roles with The Examiner and a short stint in Western Australia, Morris returned to Tasmania in the early 1980s to take up the position of The Examiner’s chief sports writer on the north-west coast, based in Devonport. It was then that Morris’ passion for sport, in particular football, truly began to shine in print. He greatly enjoyed making the trek to the various regional venues across the coast from Smithton to East Devonport – a club for which Morris had a special affinity – and over the years he became great friends with a number of the region’s best-known footballing identities, including Graeme ‘Gypsy‘ Lee and Graham Shepherd, as well as the aforementioned ‘Paddy’ Martin. His column ‘At Work, Sport and Play’ was eagerly read by many a north-west citizen, and could always be counted on to contain a piece of juicy gossip from the sporting scene. Of course Morris was shrewd enough to never make it immediately obvious to whom he may have been referring, leaving it to his readers to read between the lines, so to speak. He was extraordinarily well liked throughout the sporting community, a man who was a natural ‘people person’, a trait that aided in his journalistic work as it endeared him to many whom he would meet. Although Morris will be remembered for his contribution to football journalism in the north of the state, his lifelong passion was horse racing. He covered countless race meetings across Tasmania, Australia and internationally during his career, and formed close friendships with many racing identities, including iconic Tasmanian trainer Len Dixon and – also through football – the great Darrel Baldock, whose love of horses rivalled even Morris’. Morris sadly passed away on 4 April 2016 at the age of 62.